Commissioner Reardon, members of the wage board, thank you for providing the opportunity to testify on this important issue. My name is David Cooper. I am senior economic analyst at the Economic Policy Institute (EPI). EPI is a nonpartisan, nonprofit research organization in Washington, D.C., whose mission is to analyze the economy through the lens of the typical U.S. working family. EPI researches, develops, and advocates for public policies that help ensure the economy provides opportunity and fair rewards for all Americans, with a focus on policies to support low- and middle-income households. My research at EPI focuses on minimum wage policy and tipped minimum wage policy. I am testifying in support of gradually raising New York’s separate, lower minimum wage for tipped workers until it eventually reaches parity with the state’s regular minimum wage. Research has shown very clearly that having a two-tiered wage system leads to worse economic outcomes for tipped workers, including lower take-home pay and higher poverty rates. Research also shows that the two-tiered wage system perpetuates damaging gender and racial inequities, and likely exposes tipped workers to greater potential mistreatment by both customers and employers. By ensuring that tipped workers are protected by the same minimum wage as nontipped workers—as is currently the law in eight other states1—New York can improve working conditions and raise wages for hundreds of thousands of workers across the state. In the rest of my testimony, I am going to expand upon what the research on tipped workers and the tipped minimum wage has shown. Research indicates that having a separate, lower minimum wage for tipped workers perpetuates racial and gender inequities, and results in worse economic outcomes for tipped workers. Forcing service workers to rely on tips for their wages creates tremendous instability in income flows, making it more difficult to budget or absorb financial shocks. Furthermore, research has also shown that the practice of tipping is often discriminatory, with white service workers receiving larger tips than black service workers for the same quality of service (Lynn et al. 2008). 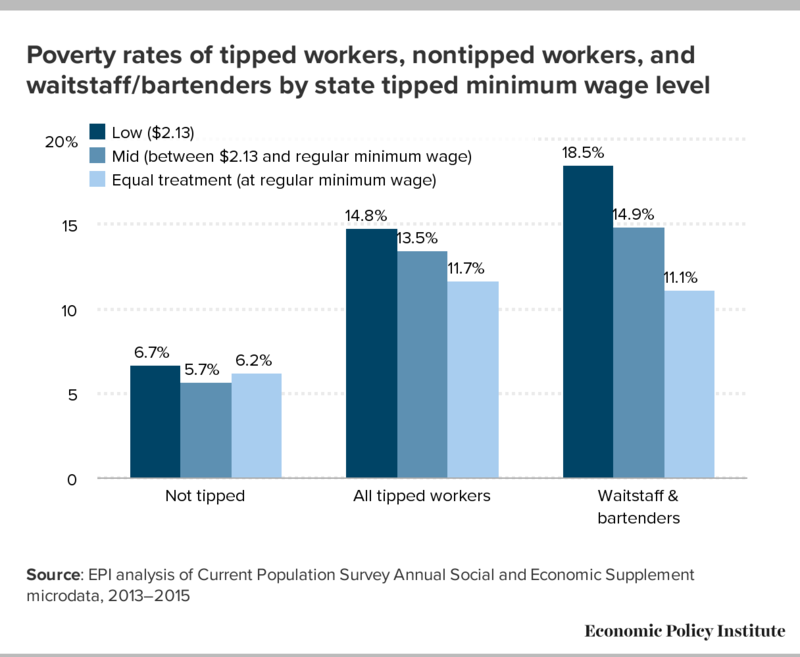 The clearest indicator of the damage caused by this separate wage floor for tipped workers is the higher poverty rate of tipped workers in states with subminimum tipped wages. As shown in Figure A, in the states where tipped workers are paid the federal tipped minimum wage of $2.13 per hour, 18.5 percent of waiters, waitresses, and bartenders are in poverty. In states with a tipped minimum wage somewhere between $2.13 and the regular minimum wage, the poverty rate of waitstaff and bartenders is 14.9 percent. (New York is part of this middle group of states with a tipped minimum wage between $2.13 and the full minimum wage.) In the states where they are paid the regular minimum wage before tips (hereafter referred to as “equal treatment states”), the poverty rate for waitstaff and bartenders is only 11.1 percent. Importantly, the poverty rates for nontipped workers are very similar regardless of states’ tipped minimum wage levels (Cooper 2017). This strongly indicates that the existence or absence of a separate, lower tipped minimum wage is driving these differences in outcomes for tipped workers. Of course, there is variation in wage levels by region across the state and within tipped industries, although tipped work remains low-wage work across all regions for most tipped workers. In the Capital/Northern New York nonmetropolitan area, the median wage of waitstaff, including tips, was $9.82 in May 2017—a mere 12 cents above the $9.70 minimum wage in that area at the time. In Nassau and Suffolk counties, the median wage of waitstaff was $12.19—significantly more than upstate, but still only 21 percent above the region’s $10.00 minimum wage. 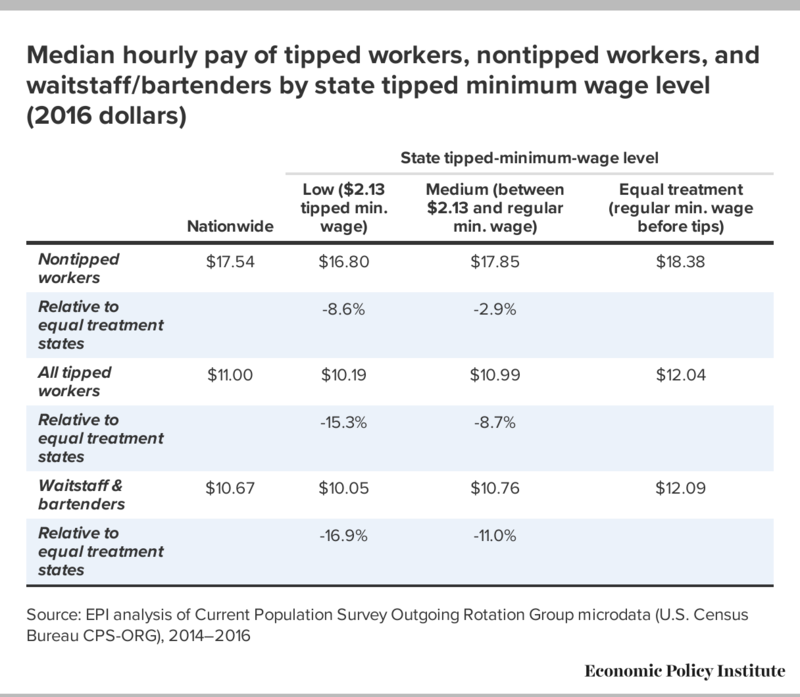 The data show that tipped workers’ median hourly pay (counting both base wages and tips) is significantly higher in equal treatment states, where tipped workers get the regular minimum wage before tips. As shown in Table 1, waiters, waitresses, and bartenders in these states earn 20 percent more per hour (including both tips and base pay) than their counterparts in states where tipped workers receive the federal tipped minimum wage of $2.13 per hour and 12 percent more than tipped workers in states like New York, with a tipped minimum wage between $2.13 and the full minimum wage. There is no evidence that net hourly earnings go down, such as from customers tipping less, when tipped workers are paid the regular minimum wage (Cooper 2017). Examining data specific to New York shows a clear advantage to waitstaff in equal treatment states. In equal-treatment California, when the statewide minimum wage was $10.50—8.2 percent higher than the upstate New York minimum wage of $9.70—waitstaff there earned 23 percent more per hour than waitstaff in upstate New York. In equal-treatment Washington state, when the minimum wage was $11.00—the same as the minimum wage in New York City—the median wage for waitstaff across the state was 2.2 percent higher than in New York City. Even in equal-treatment Alaska, where the state minimum wage was $9.80 in May 2017—a mere 1 percent higher than the minimum wage in upstate New York—waitstaff there earned 8.8 percent more per hour. Fears of lower wages from equal treatment are unfounded for the large majority of waitstaff (BLS-OES). Fears of industry collapse from eliminating the lower tipped minimum wage are also unfounded. The restaurant industry thrives in equal treatment states. In one of the most comprehensive studies on the minimum wage, researchers aggregated the results of over four decades of studies on the employment effects of the minimum wage. They concluded that there is “little or no significant impact of minimum wage increases on employment” (Schmitt 2013). Affected businesses are typically able to absorb additional labor costs through increases in productivity, reductions in turnover costs, compressing internal wage ladders, and modest price increases (Hirsch, Kaufman, and Zelenska 2015). Furthermore, research specific to the tipped minimum wage also found no significant effect on employment (Allegretto and Nadler 2015). 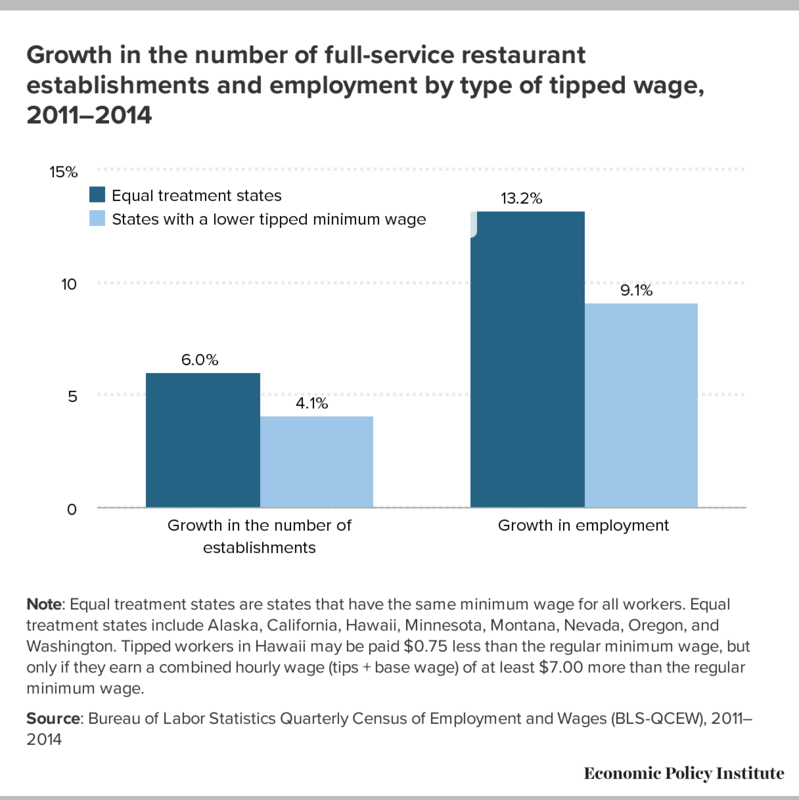 According to the Quarterly Census of Employment and Wages (BLS-QCEW), full-service restaurants in equal treatment states saw stronger growth both in terms of number of establishments and number of jobs compared with states with a separate, lower minimum wage for tipped workers (Figure B). Between 2011 and 2014, equal treatment states saw 6.0 percent growth in the number of establishments compared with 4.1 percent growth in states with separate, lower tipped minimum wages. Likewise, employment grew 13.2 percent in equal treatment states compared with 9.1 percent in other states. Note: Equal treatment states are states that have the same minimum wage for all workers. Equal treatment states include Alaska, California, Hawaii, Minnesota, Montana, Nevada, Oregon, and Washington. Tipped workers in Hawaii may be paid $0.75 less than the regular minimum wage, but only if they earn a combined hourly wage (tips + base wage) of at least $7.00 more than the regular minimum wage. Furthermore, higher minimum wages mean better working and living conditions for numerous workers in the region, and more money in the hands of consumers likely to spend in area businesses. Finally, policymakers should understand that wage theft is particularly acute in industries with large numbers of tipped workers, in part because of the disparate treatment of tipped employees. A large number of restaurants and bars across the country have been found to be in violation of wage and hour laws, and in 2015, the New York Times published a shocking expose of rampant wage and hour abuse in New York’s nail salon industry—another large employer of tipped workers (Maslin Nir 2015). It is true that the law requires employers to ensure that tipped workers receive at least the regular minimum wage when their tips are included, but the reality is that huge numbers of businesses—aided by too-weak enforcement efforts—ignore these requirements. In investigations of over 9,000 restaurants, the U.S. Department of Labor (DOL) found that 84 percent of investigated restaurants were in violation of wage and hour laws, including nearly 1,200 violations of the requirement to bring tipped workers’ wages up to the minimum wage (Allegretto and Cooper 2014). Among the restaurants that were investigated, tipped workers were cheated out of nearly $5.5 million. Research has also shown that workers in the food and drink service industries are more likely to suffer minimum wage violations than workers in other industries (Cooper and Kroeger 2017). There is no economic justification for maintaining a system where customers directly pay the bulk of the wages for a business’s employee—and the wage paid is almost entirely at the consumer’s discretion. Consider the outrage that would ensue if other professions operated this same way. If every time a car salesperson made a sale, the dealership subtracted that commission from the salesperson’s salary, car dealerships would likely have a difficult time hiring and retaining car salespeople. Yet the law allows tipped workers to suffer this indignity all the time simply as an artifact of social norms that originated in the feudal system and are believed to have been promulgated in the United States out of a reluctance to pay newly freed slaves (Oatman 2016). I encourage the wage board to do away with this antiquated and harmful practice. There is no plausible reason why restaurants and other employers of tipped staff in Alaska, California, Hawaii, Minnesota, Montana, Nevada, Oregon, and Washington can pay their tipped workers the regular minimum wage regardless of tips, yet New York businesses cannot. It is simply a policy choice. 1. Tipped workers receive the full minimum wage regardless of tips in Alaska, California, Minnesota, Montana, Nevada, Oregon, and Washington. Tipped workers in Hawaii may be paid $0.75 less than the regular minimum wage, but only if they earn a combined hourly wage (tips + base wage) of at least $7.00 more than the regular minimum wage. 2. Author’s calculations using Current Population Survey Outgoing Rotation Group microdata (U.S. Census Bureau CPS ORG 2017). Bureau of Labor Statistics, Occupational Employment Statistics (OES). 2017. Public data series accessed through the OES Databases. Accessed June 2018. Bureau of Labor Statistics, Quarterly Census of Employment and Wages (BLS-QCEW). Various years. Public data series accessed through the QCEW Databases and through series reports. Accessed May 2016. U.S. Census Bureau, Current Population Survey Annual Social and Economic Supplement microdata (U.S. Census Bureau CPS-ASEC). Various years. Survey conducted by the Bureau of the Census for the Bureau of Labor Statistics [machine-readable microdata file]. U.S. Census Bureau, Current Population Survey Outgoing Rotation Group microdata (U.S. Census Bureau CPS-ORG). Various years. Survey conducted by the Bureau of the Census for the Bureau of Labor Statistics [machine-readable microdata file]. Accessed February 2018, at https://thedataweb.rm.census.gov/ftp/cps_ftp.html.